By buying this product you can collect up to 893 Yachtaid Points. Your cart will total 893 points that will be converted into a voucher towards your next purchase! Must be logged in to collect points. The Dometic RM42DC-417 Remote Modulating Marine Air Condensing Unit is the next generation of cooling-only air conditioning units. 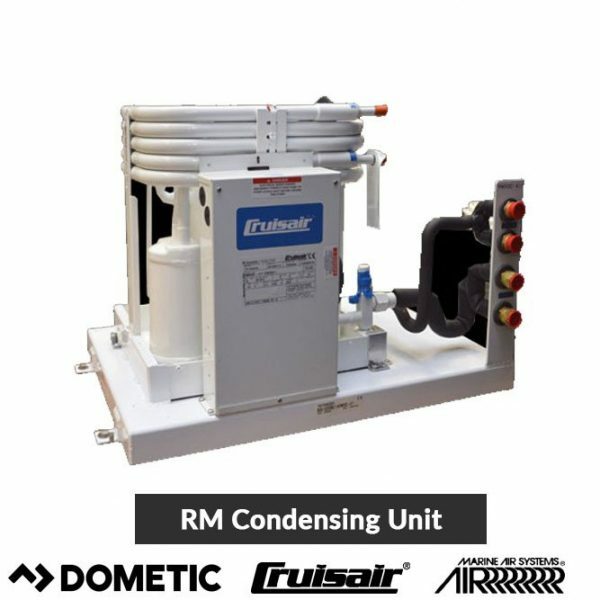 The RM series is designed to run multiple cooling units (evaporators) with up to five independent zones. Its higher efficiency compressors deliver full capacity even under heavy loads. The innovative with one-piece electrical box with 3 ft. (0.9 m) cable can be remotely mounted with ease, by simply removing one screw. Additional service ports have been added for convenient charging and servicing. The one-piece chassis/pan has two new drain locations. Hold-down brackets secure all four corners and allow for easier installation and removal, while compressor vibration isolation mounts reduce noise. Various custom designed components – high and low pressure switches, large capacity receiver and accumulator, hot gas bypass valve, and a thermal expansion de-superheat valve – protect the compressor when operating at full and partial loads, ensuring reliable operation. An electrical control and relay box are mounted on the chassis, but can be remote mounted on a 3 ft. (0.9 m) harness for easy access.